In Theodore Wirth’s 30 years as Minneapolis’s superintendent of parks (1906-1935), he produced annual reports that contained 328 maps, plans or designs for parks and park structures. Most of the plans were accompanied by some explanatory text, which provides a rich record of park board activity and Theodore Wirth’s priorities. The annual reports include plans for recreation shelters, bridges, parkways, parks, playgrounds, gardens, golf courses, and more. Nearly every Minneapolis park is represented in some form, from if-cost-were-no-object conceptual designs for new parks to the “rearrangement” of existing parks. Many of the plans were never implemented due to cost or other objections; others were considerably modified after input from commissioners and the public. In many cases over the years, Wirth referred in his written narratives to plans published in prior years that he hoped the board would implement. Sometimes it did, often it didn’t. One of the drawbacks to implementing Wirth’s plans was the method of financing park acquisitions and improvements during much of his tenure as superintendent. The costs of both were often assessed on “benefitted” property, along with real estate tax bills. In other words, the people who lived near a park and received the “benefit” of it—both in enjoyment and increased property values—had to pay the cost, usually through assessments spread over ten years. To be able to assess those costs, however, a majority of property owners had to agree to the assessment, and in many neighborhoods property owners refused to agree until plans were modified considerably to reduce costs. 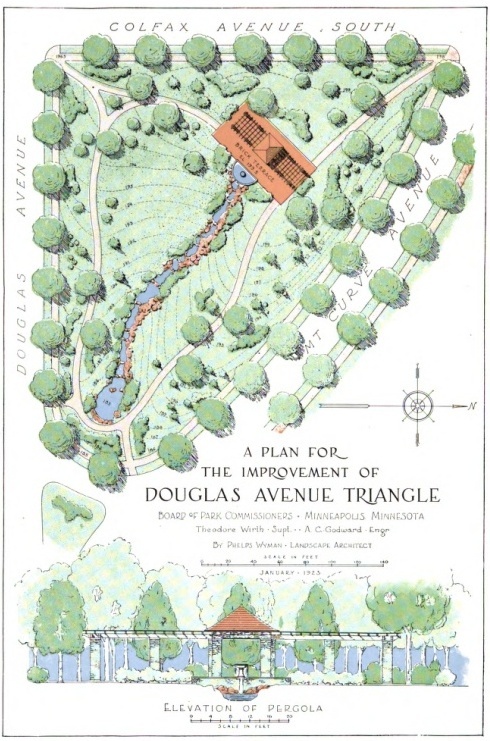 Phelps Wyman’s plan for what is now Thomas Lowry Park from the 1922 annual report is one of the only colored plans and one of the only plans that wasn’t produced by the park board staff. Many of the annual report drawings contain a “Designed by” tag, but many do not have any attribution. For those that don’t, it is sometimes unclear who the actual designer was. In many cases it would have been Wirth, but in some cases—the golf courses are notable examples—others would have been responsible for the layouts even though they weren’t credited. William Clark, for instance, is known to have designed the first Minneapolis golf courses, Wirth said so, but only Wirth’s name appears on these plans, not Clark’s. Also, because these plans were created while Wirth was superintendent does not mean that the idea for each project originated with Wirth. Some of the demands for the parks featured here pre-dated Wirth’s arrival in Minneapolis by decades. Other plans were largely his creation. In most cases, however, Wirth was responsible for implementing those plans. The majority of the drawings were reproduced on a thin, tissue-like paper that could be folded small enough to be glued into the annual reports. The intent was to publish plans large enough to be readable, but not too bulky. The paper is fragile and easily torn when unfolding; I doubt that many of the plans survive. Even where efforts have been made to preserve and digitize the annual reports, such as by Hathitrust and Google Books, the plans on the translucent sheets are not reproduced. In many cases it would require a large-format scanner to digitize them from the annual reports. Originals do not exist for most of these plans, because they were not working plans. I’ve been threatening for some time to do something that probably only the planners at the Minneapolis park board and a few others will appreciate. I’m publishing a complete list of the park plans that appeared in the annual reports of the park board. I’m periodically asked when a certain park was discussed, acquired or planned and I search my list of annual report plans quickly to provide some direction. I hope that by publishing this catalog of park plans I can save other researchers a great deal of time. Unfortunately I do not have copies or scans of the plans themselves. Neither does the park board. You’ll have to go to the Central Library in downtown Minneapolis to view the original annual reports and see these plans. The Gale Library at the Minnesota Historical Society also has copies of the park board’s annual reports for many years. The annual reports of the park board were divided into several parts: a report by the president of the park board, reports by the superintendent and attorney, financial reports, and an inventory of park properties. Most of the plans described here were a part of the superintendent’s report. For that reason, I’ve cited the date on Wirth’s reports rather than the date of the president’s report, which at times differed. I will post the catalog of plans, maps and drawings in three “volumes” due to the size of the file—more than 9,000 words in total. The titles of the plans are verbatim as they appear on plans. I’ve also copied dates, names and titles as they appear, but have added some punctuation to make them easier to read. Parenthetical comments identify current park names or highlight important plan elements. /s/ indicates a signature. Wilson Park: Plan for improvement of Wilson Park (the park no longer exists) (p. 24), May 1906, by /s/ Theodore Wirth, Sup’t. Plan Showing Proposed Arrangement of Walks and Playgrounds Surrounding Loring Pavilion, Loring Park (p. 38), Jan’y 1, 1907, by /s/ Theodore Wirth, Supt. Plan for the General Improvement of Minnehaha Avenue & Park from 48th St. to 52nd St. Showing Rearrangement of Trolley and Railroad Tracks (includes cross-sections and profile) (fold out, p. 40a), Jan. 1, 1907, by /s/ Theodore Wirth, Sup’t. Suggested Extension of Glenwood Park (Theodore Wirth Park) (West, south and east of existing park at the time, which surrounded Birch Pond) (p. 44), Jan. 1907, /s/ Theodore Wirth, Sup’t. Suggested Widening of Minnehaha Parkway (fold out, p. 48a), Jan. 1097, /s/ Theodore Wirth, Sup’t. Map of Minneapolis 1907 (fold out, inside back cover), Copyright 1906, Fred W. Kirk. Park properties colored in green. Perspective Sketch for Powderhorn Park Shelter (p. 46), Undated, no attribution, likely by architect. Map of Lake of the Isles – Showing Improvements, Change of Shore Lines and Boulevard During 1908 (fold out, p. 20a), /s/ Theodore Wirth, Superintendent, W. E. Stoopes, C.E. Plan “C” for the Improvement of Lake Street from Calhoun Boulevard to Dean Boulevard (fold out, p. 56a), /s/ Theodore Wirth, Supt of Parks, W. E. Stoopes, C.E. Del. Plan for the Improvement of St. Anthony Heights (Tower Hill) (fold out, p. 64a) Jan. 1st, 1909, Designed by /s/ Theodore Wirth, Supt of Parks, A.C. Godward, Del. Minnehaha Park and Minnesota Soldiers’ Home (p. 40a), “This cut is loaned by courtesy of Twin City Rapid Transit Co.” The M.N. Works, Buffalo, N.Y.
General Plan for the Improvement of Camden Park (fold out, p. 48a), Jan’y 1st, 1910, Designed by /s/ Theodore Wirth, Sup’t of Parks, A.C. Godward, Eng’r & Del. Diagram of Wells Drilled During 1909 (fold out, 56a), January 1, 1910, /s/ Theodore Wirth, Sup’t of Parks, A.C.G. General Plan for Cedar Lake Boulevard Showing Connection with Lake of the Isles and Dean Boulevard (shows shore line after the lake drops five feet) (fold out, p. 86a), January 1910, /s/ Theodore Wirth Supt of Parks, W.E. Stoopes, Eng’r & Del. General Plan for the Improvement of Elliot Park (Plan A includes sunken flower garden, Plan B has playground instead) (fold out, p. 90a & 92a), January 1910, Designed by /s/ Theodore Wirth Sup’t of Parks, A.C. Godward, Eng’r & Del. Suggestive Plan for a Main Parkway Entrance and a Cathedral Concourse (p. 93), Jan’y 10th 1909, Designed by /s/ Theodore Wirth, Sup’t of Parks, A.C. Godward, Del. Suggestive Plan for The Gateway, January 1st, 1910, Designed by /s/ Theodore Wirth, Supt of Parks, A.C. Godward, Del. Map of West River Bank Showing Desired Acquisition between Franklin and Washington Avenues (p. 104a), Theo. Wirth, Supt., W.E. Stoopes, Eng. General Plan Showing the Improvements at Lake of the Isles Park (fold out, p. 102a), January 1911, As Designed by /s/ Theodore Wirth, Sup’t of Parks, I. Kvitrud, Del. Plan for the Rearrangement of Dean Boulevard as a Connecting Link between Lake of the Isles, Cedar Lake and Calhoun Boulevards (fold out, p. 104a), January 1911, Designed by /s/ Theodore Wirth, Supt of Parks, A.C. Godward, C.E. Del. Preliminary Plan for the Improvement of Lake Calhoun (includes lagoon in NW corner as site of private or club boat house) (p.110a, fold out) January 1911, Designed by /s/ Theodore Wirth, Supt of Parks, A.C. Godward C. Engr. Plan for the Improvement of Stevens Square (fold out, p. 120b), January 1911, Designed by /s/ Theodore Wirth, Supt of Parks, A.C. Godward, C.E. Del. Map of Minneapolis Park System and Proposed Extensions 1912 (p. 11), Prepared by A.C. Godward, C.E. Suggested Extension of 8th Avenue North and Vacation of 6th Avenue North through Glenwood Park (p. 108a; fold out), Jan’y 1912, /s/ Theodore Wirth, Supt of Parks, A.C. Godward, C.E. General Plan for the Improvement of The Parade Providing for a Modern Athletic Field and a Main Parkway Entrance and Suggesting the Location of a Coliseum or Auditorium and a Treatment of the Grounds in the Vicinity of Public Buildings (p. 114a, fold out), January 1912, Designed by /s/ Theodore Wirth, Sup’t of Parks, Prepared by A.C. Godward C.E. Plan for the Rearrangement of Walks and Plantings at Van Cleve Park (p. 118a, fold out), January 1912, Designed by /s/ Theodore Wirth, A.C. Godward, Del. Plan of Proposed Improvements at Franklin Steele Square (p. 120a, fold out), Designed by /s/ Theodore Wirth, Supt of Parks, A. C. Godward, Del. 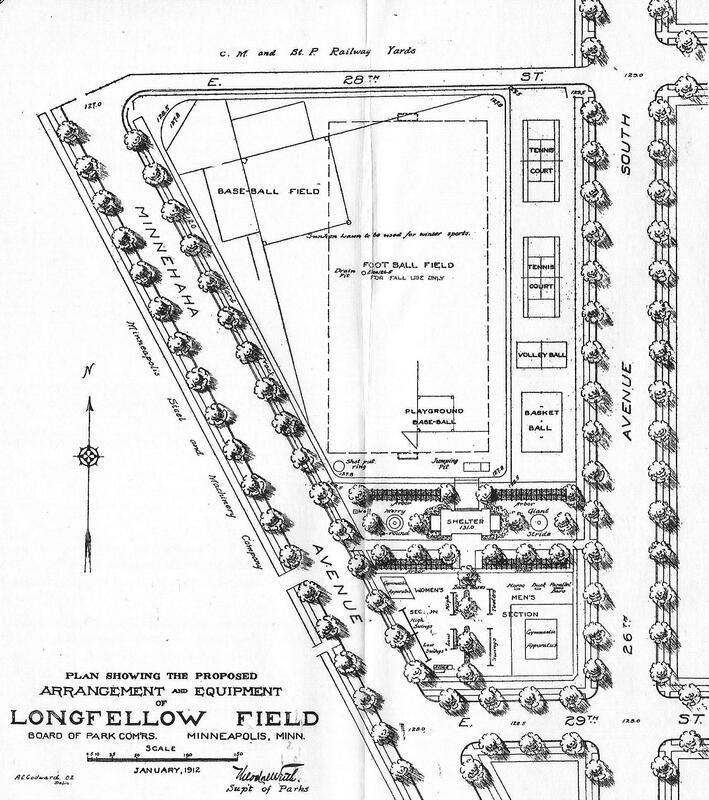 Plan Showing the Proposed Arrangement and Equipment of Longfellow Field (p. 122a, fold out) (This is the first Longfellow Field), January 1912, /s/ Theodore Wirth, Supt of Parks, A. C. Godward, C.E. Delin. Suggestive Sketch for a Parkway between Calhoun Lagoon and Hennepin Avenue (The Mall) (p. 66a, fold out), Sept. 16, 1911, /s/ Theodore Wirth, Supt of Parks, /s/ A. C. Godward Engineer, I. Kvitrud, Del. General Plan for the Improvement of Columbia Park (p. 96a, fold out) January, 1913, Designed by /s/ Theodore Wirth, Supt of Parks, Prepared by A.C. Godward, C.E. Glenwood – Camden Parkway, Humboldt Avenue to Lyndale Avenue (p. 98a, fold out), January, 1913, Designed by /s/ Theodore Wirth, Supt of Parks, Prepared by A.C. Godward, C.E. General Plan for the Improvement of Lake Nokomis (p. 106a, fold out), January, 1913, Designed by /s/ Theodore Wirth, Supt of Parks, Prepared by A.C. Godward, C.E. Suggestive Plan for the Acquisition and Improvement of Rice Lake and Minnehaha Creek (p. 24a, fold out) January 1915, /s/ Theodore Wirth, Supt. of Parks /s/ A. C. Godward, Engr. Plan of Lakes Showing Launch Routes and Landings (p. 105), January 1915, /s/ Theodore Wirth, Supt. Plan for the Improvement of Audubon Park (p. 106a, fold out) January 1915, Designed by /s/ Theodore Wirth, Sup’t. Preliminary Ground Floor Plan for the Lake Nokomis Bath-House (p.110) January 1915, /s/ Theodore Wirth, Sup’t. Plan for the Rearrangement of Dean Boulevard as a Connecting Link between Lake of the Isles, Cedar Lake and Calhoun Boulevards (p. 110a, fold out), April 1914, /s/ Theodore Wirth, Supt., A.C. Godward, Engr. Powderhorn Lake Park, Plan for the Improvement of the South Section (p. 112a, fold out) January 1915, Designed by /s/ Theodore Wirth Sup’t. Armory Garden: Proposed Rearrangement (p. 113) January 1915 /s/ Theodore Wirth Supt. General Plan for the Improvement of Farview Park (p. 42a, fold out), January 1916, Designed by /s/ Theodore Wirth, Sup’t. If you have questions or need clarification on anything in this index, please send me a note. I’ll post the rest of the Index to Minneapolis Park Plans soon. After the publication of the final installment of this index, I’ll post a “Who’s Who” to identify all the people whose names are included in these entries. « Now That’s a Teeter Totter! Thanks for your question, Diane. I haven’t written about any of the architects of Minneapolis park buildings. In my “Who’s Who” I included only engineers and delineators of park plans. Your question suggests, however, that I should really devote a post or two to the architects. Off the top of my head I can tell you that Chapman was the architect for the bath house at Lake Calhoun, built in 1912, and the recreation center at Logan Park in 1913. He also submitted the second place design in 1909 design contest for bridges over the canals linking Lake of the Isles with Lake Calhoun and Cedar Lake. That plan was entered by Chapman and civil engineer William Pierce Cowles. I believe their design was used for the bridge on the Lake of the Isles end of the canal that linked Calhoun and Isles. Chapman also designed other rec centers in Minneapolis parks — one at Van Cleve Park, I recall — but none as large or important as the one at Logan Park. You might check into the Northwest Architectural Archives at the University of Minnesota to see if they have more information on Chapman. Wonderful, to index these plans! I have just one nuance, on Wirth’s implementation of his park plans. It has to do with Wirth’s own reiterated statement, that he could not have done what he did to build out the Minneapolis park and parkway system without the Elwell Law. 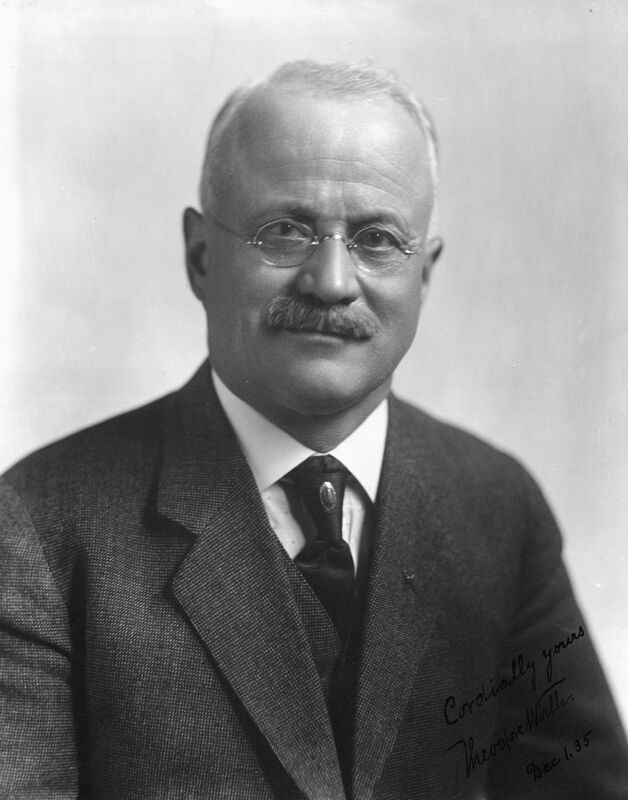 That law, proposed and passed through the state legislature by Sen. James T. Elwell in 1909 with subsequent diddlings, provided for the acquisition and improvement of park and parkway land where the “benefitted” property owners did NOT have to pay the entire cost. Elwell came up with a formula that shared the costs between “benefitted” properties, and city taxpayers. Elwell lived in the Como neighborhood. In the early 1890s, he owned most of the land surrounding The Second Ward Park, today’s Van Cleve Park. The assessments on his land for costs of buying and improving Van Cleve Park were contributors to Elwell’s bankruptcy. He never forgot that. When he was elected to the state Senate in 1906, he made reform of how that assessing of costs was done a top priority. In fact, Minneapolis street paving, with gutters and curbs and sidewalks, was a huge beneficiary of the Elwell Law. Thanks for that information, Connie. I’d never heard the story of Elwell and his bankruptcy as the seed of the Elwell Law before. The Elwell Law did provide for a division of the assessments, although the park board had the prerogative to pay for parks with city bonds as well, or to apportion a greater percentage of costs to the entire city. The essential point to my raising the assessments in the context of this article was to emphasize that property owners held a veto power on those assessments for parks and Wirth’s more elaborate development plans frequently had to be scaled back because of it. He complained bitterly, for instance, of the refusal of property owners in the vicinity of Folwell Park to approve his development plans for that park for years, which lead to a gap of several years between acquisition and development. While Wirth was a great supporter of the Elwell Law as a means to pay for parks, some later park commissioners and superintendents believed it had led to inequities in park development with newer, more affluent neighborhoods getting parks and older, poorer neighborhoods going without. That was some of the reasoning behind discussions of park financing methods as early as the 1930s and the elimination of the assessment method of park financing in the 1960s when Robert Ruhe was superintendent. After that, all park developments were paid for with bonds. The author’s error as to the provisions of the Elwell Law of 1911 in the comment may arise from the fact that there were two Elwell Laws passed that year, often referred to as “outside” and “inside” to distinguish them. The “outside” Elwell Law applied to state highways and did limit the assessments of property owners to 1/4 of the cost of highways. That law was overwhelmingly repealed by the 1915 state legislature. The “inside” Elwell Law, the one that survived, provided a mechanism for Minneapolis to finance street and park development. Rather than restricting the authority of the city council or park board to assess property owners for streets and parks, the law facilitated it. Many Minneapolis park acquisitions and improvements were financed by “100% District Elwell” assessments — meaning that all the cost was assessed on property owners who benefitted from the action as determined soley by the park board. The largest “100% District Elwell” was $555,000 to purchase Rice Lake (Lake Hiawatha) and Minnehaha Creek from Lake Hiawatha to the falls in 1922. See the fabulous chart in the 1932 annual report that lists how the acquisition of every park was financed. For a detailed explanation of how the assessments were calculated see Park and Recreation magazine, May-June 1922, “Financing Neighborhood Playgrounds by Special Assessment,” by Charles E. Doell, Assistant Engineer, Minneapolis Board of Park Commissioners. Doell was later Superintendent of Minneapolis parks. More on all of these issues soon. This is very valuable work, David. Thank you! Many of the drawings included in annual-reports are available in antique shops, but unfortunately they have been separated from their original context! Thanks, Bill and Andrew. I hope it’s useful to you. What an undertaking! A valuable resource. I have marveled at the details of the annual reports in which these were included.